There are many people in your life that bring you wisdom. Sometimes that comes from a parent, a supervisor, a friend, and even at times, from a child. Now and then wisdom can even come to you from a wise puppet and there was none wiser than Yoda. This green pupet that stood just under 2′ 2″ and that sounded so much like Grover, thanks to Frank Oz, was a powerful force (pardon the pun) in the mindset of many. It does not matter if you are young or old, Yoda has crossed your path. 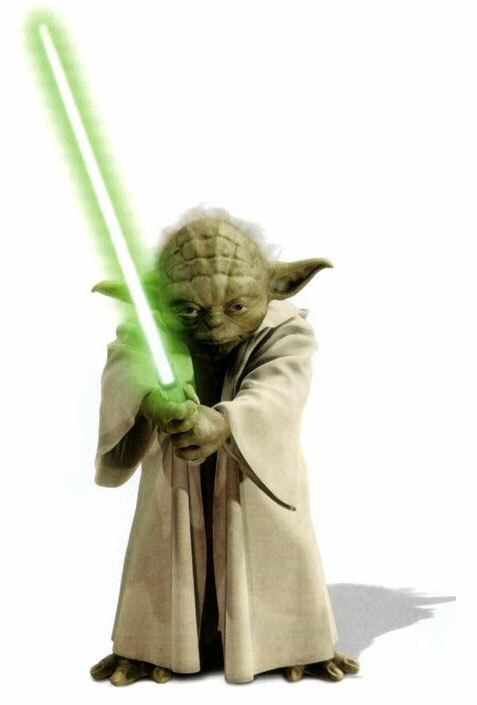 Once you were able to understand what Yoda was saying through his backwards english you will see that some of his powerful sayings are all you need to remember when you need to adjust your mindset. When you are feeling challenged, just remember this lesson. A mentor of mine used to remind us of this rule all the time. We would be asked to try and put our pen down. Go ahead, try this yourself…try to put your pen down. It isn’t possible. You either DID put your pen down or you DID NOT. Thankfully my mentor did not also have to live in hiding and we didn’t have to visit a hut in a swamp to get wise advice. There are times when success is not possible where we currently are in life. Maybe you can’t lift that 300 pound barbell or maybe you can’t run a 4 minute mile. If it is something that you want to do, then follow Yoda’s sage advice and just go out and do it. Work up to it first, just remember there is no try. Another of the jedi master’s sayings was, “Fear leads to anger, anger leads to hate, hate leads to suffering” You don’t want to suffer do you? People will say that suffering makes you stronger and it doesn’t seem that Yoda would agree with that comment. Hate is what brings suffering, anger brings hate and fear is what leads to anger. Figure out where you are in that path and stop it right away. Do not try to stop it, just stop with the fear, the anger and the hate and live in a place that brings you happiness and where you can overcome your fear. The third piece of wisdom that we want to take a look at today is when Yoda said to Luke Skywalker, “Size matters not. Look at me. Judge me by my size do you?” Yoda was not a tall creature and still he was filled with the power of the force. You might not be able to handle a light saber like Yoda or lift a crashed X-Wing fighter from the swamp and still that should not stop you from any goal you have in your sight. You might be too small, or too big and that doesn’t matter. Your goal might be too large for others to even see, and that shouldn’t matter either. Forget your size and know that you can accomplish anything that you set your mind to and work towards. We celebrate May 4th each year as Star Wars day (who else would have thought of the marketing potential of using the calendar like this) and hope that taking a moment to listen to the wise Yoda has helped you figure out how to live long and prosper. ***the writer is well aware of the Star Trek reference, it was not a mistake. Chadalyst – (this is not a typo this is a catalyst provided by Chad to give you one thing to take away from this blog and do to help you grow) In honor of Yoda, do not try. To help you with this find an accountability partner and any time they hear you say you are going to try something, you have to pay them $1. This will help you remove this word from your vocabulary. I will “try” to remember!